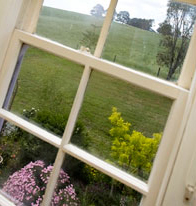 Barrabool Hills Retreat has three comfortable, tastefully-furnished guest bedrooms, overlooking the sweeping hills and gardens. Soak up the ambience and enjoy the peace, quiet and little luxuries. Each room is individual and well-appointed, with window treatments for privacy and relaxation. 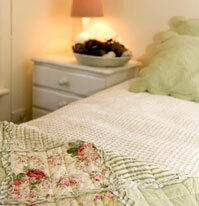 The snug, quality bedding offers a selection of pillows and has electric blankets, to ensure a restful night. Cot available. The shared bathroom, with 2 Bathrobes per room provided, has: a separate bath, basin, shower and W.C. Hairdryer and complimentary toiletries supplied.